Russ Ritell was born 40 minutes north of NYC. An illustration & design major, Russ graduated from the School of Visual Arts, and has been working professionally as a designer / animator for the past 17 years. This profession has allowed Russ to grow by expanding his artistic abilities to include animation, video and technical knowledge into recent projects. A father of two girls, Russell finds time to work, passionately, on paintings and conceptual work at his home studio in Cold Spring, NY. Although he has explored other mediums to communicate his ideas, Ritell is primarily a painter. Experimental and playful at times Russ always pays attention to detail. Most recently his paintings combine a realistic observation of the human physical and emotional states using high contrast lighting to vividly express scenes of physical and psychological reality. This work is powerful in creating a mood, and seem to capture a dramatic, even theatrical moments in time. 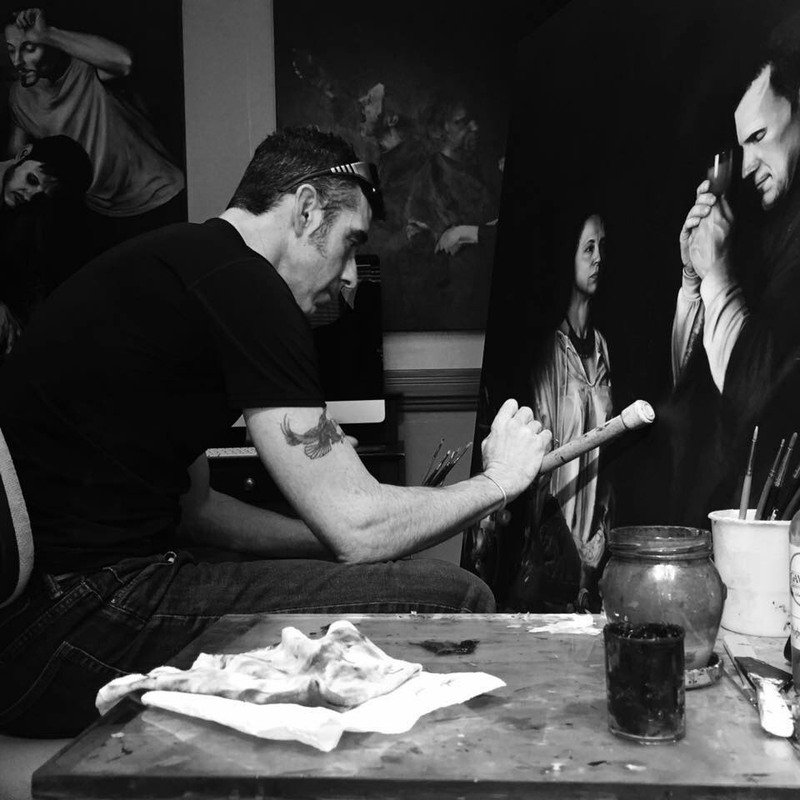 Ritell’s current series of oil paintings are directly influenced by the artwork of Caravaggio. In some cases he has intentionally emulated the artist’s composition & lighting by referencing and “contemporizing” the subject matter from his paintings. In Gorgon the tattooist is actually branding the subject with a Caravaggio image. The Medusa head (Gorgon) on his shoulder gives homage to the artist and acts as an “inside joke” or a direct clue referencing the original painting. Russ has exhibited his work in Manhattan, Brooklyn, Harlem, New Jersey, the Hudson Valley, and Berlin.